I am very new to the Rest toolbox and have two questions regarding the ALFF analysis with Rest. 1. I am wondering why it appears as if my brain input is "distorted" after the bandpass filtering step or when I exclude the filtering, after the ALFF step? I attached pitcure: the first image is the preprocessed file, the seconds the detrended file, the third the detrended & filtered file and the fourth the ALFF_map. 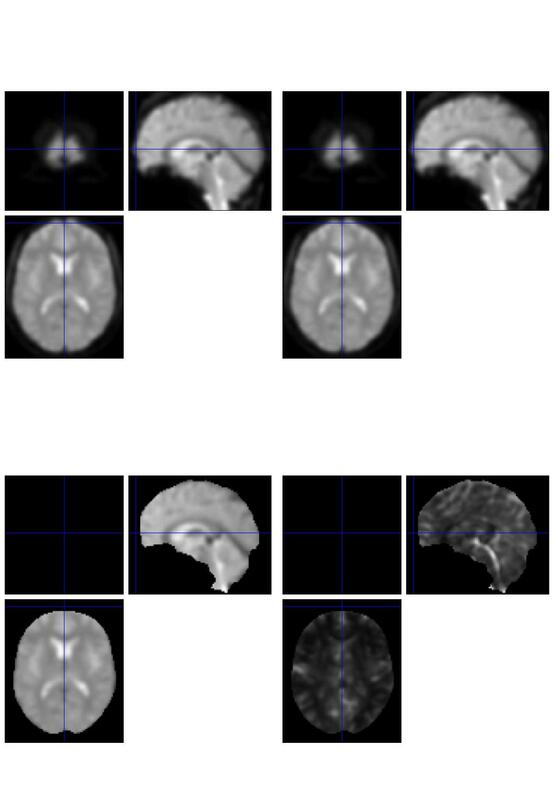 And as the blue haircross shows, a few milimeters have "disappeared" from the brain mask with the filtering step and in the ALFF_map compared to the original and detrended file. Am I doing something wrong or is this distortion "normal" and caused by the filtering? 2. I am trying to script the analysis without the GUI. So far, I only receive the ALFF_map as output with the alff.m function. However, I would also like to generate the mALFF_map with my script and was wondering whether there is another function for it or if I will need to script this step? 1) You don't need to bandpass filter before ALFF claculation. 2)You can use script or RESTplus to calculate mALFF.